Will the Bulldogs, no longer underdogs, be embraced in the NBA home of John Stockton? The 40th anniversary of Magic Johnson vs. Larry Bird in Salt Lake City played a part in the University of Utah’s landing a host’s role in the 2019 NCAA Tournament. The event is returning to Vivint Smart Home Arena for a second time in three seasons, extending a theme of tournament history: Every time Gonzaga is a No. 1 seed, the Bulldogs come to town. In the buildup to Selection Sunday, there was considerable talk of Gonzaga's dropping to a No. 2 seed after losing to Saint Mary's in the championship game of the West Coast Conference tournament in Las Vegas. 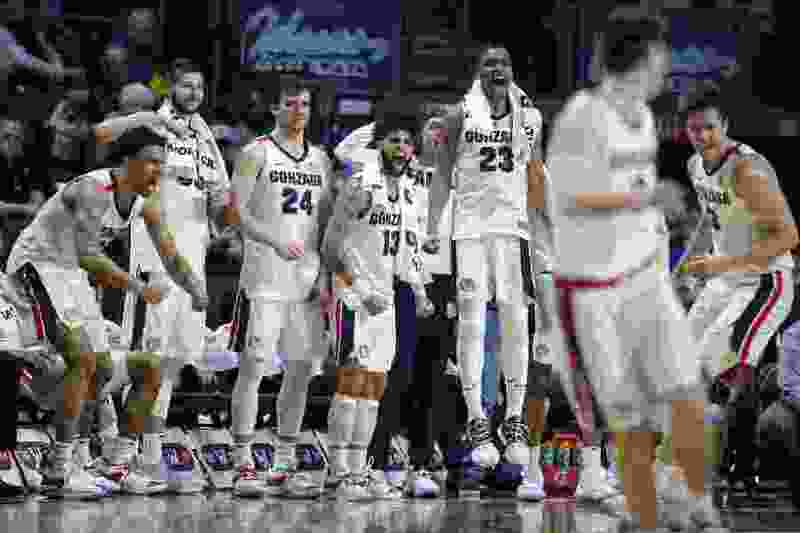 But the Bulldogs (30-3) stayed on the top line in the West Region and were assigned to Vivint Smart Home Arena for the third time in seven seasons. Gonzaga will play Thursday against a No. 16 seed, the winner of Tuesday's game between Fairleigh Dickinson and Prairie View A&M. This is the first time in Salt Lake City's long NCAA Tournament history that a First Four team will be coming to town from Dayton, Ohio. As a No. 1 seed, Gonzaga lost to Wichita State in the round of 32 in 2013. But the Bulldogs beat South Dakota State and Northwestern in 2017 on their way to the NCAA championship game. The other West Region first-round pairing at Vivint is No. 8 seed Syracuse vs. No. 9 Baylor. In part of the Midwest Region bracket, No. 5 seed Auburn will meet No. 12 New Mexico State and No. 4 Kansas will face No. 13 Northeastern. To observe the anniversary of the 1979 championship game between Michigan State and Indiana State, Utah administrators tried unsuccessfully to bring Johnson and Bird to town for a promotional event, Ute coach Larry Krystkowiak said. Gonzaga has strong ties to Salt Lake City, the home of the McCarthey family of GU benefactors and the place where Bulldog/Jazz legend John Stockton played in the NBA for 19 seasons. As coach Mark Few has pointed out, the Bulldogs haven’t been embraced completely in Utah, now that they’ve outgrown underdog status as a No. 1 seed. Fans cheered Southern University’s upset bid in 2013 and Northwestern was popular as a second-round contestant in 2017, when the Wildcats made their first NCAA appearance. Even so, the Bulldogs advanced from Salt Lake City on the way to their first Final Four, eventually losing to North Carolina in the championship game. This year’s rare variable is Gonzaga’s having lost its last game. The Bulldogs fell 60-47 to Saint Mary’s in the West Coast Conference championship Tuesday in Las Vegas after ransacking the league in the regular season. By forward Corey Kispert’s account in The Spokesman-Review, Few immediately looked ahead to this week as he entered the losing locker room. “Coach Few came in here and the first words out of his mouth were, ‘We’ve got to find a way to make this a positive for us. Learn and correct the things that make us beatable. And correct it fast — we don’t have much time.’ ” Kispert said. Gonzaga features two of the country’s top players, Brandon Clarke and Rui Hachimura. No. 8 seed Syracuse and No. 9 Baylor are Gonzaga’s potential second-round opponents. Baylor lost some of its appeal at Vivint when Olympus High School graduate Jake Lindsey, a son of Jazz general manager Dennis Lindsey, sat out this season and recently announced his retirement from basketball for medical reasons. Salt Lake City’s portion of the Midwest Region bracket includes an opportunity for one of the tournament’s better second-round matchups. No. 4 Kansas and No. 5 Auburn are seeded to meet Saturday, although Auburn could face a challenge from Western Athletic Conference champion New Mexico State in the first round. No. 1 Gonzaga (30-3) – The Bulldogs are visiting Salt Lake City as a No. 1 seed for the third time in seven years. The difference this time is they’re coming off a loss to Saint Mary’s in the West Coast Conference title game. No. 16 Fairleigh Dickinson (20-13)/Prairie View A&M (22-12) – The teams will meet Tuesday at Dayton, Ohio. FDU, from New Jersey, lost a First Four game in 2016. Prairie View, the alma mater of Utah Stars great Zelmo Beaty, is in the tournament for the first time since 1998. No. 8 Syracuse (20-13) – The Orange claim a road win over Duke, but they’ve stumbled lately with four losses in six games. Syracuse played in the Sweet 16 in Salt Lake City in 2010, losing to Gordon Hayward’s Butler team. No. 9 Baylor (19-13) – The Bears have lost four straight games. Jazz general manager Dennis Lindsey is a former Baylor player. Coach Scott Drew’s brother, Bryce, coached Vanderbilt in the 2017 first round in Salt Lake City. No. 4 Kansas (25-9) – Assigned to the Midwest Region as the top No. 4 seed in the field, the Jayhawks would play in Kansas City in the Sweet 16 if they advance from Salt Lake City. This is Kansas’ lowest seed since 2006. No. 13 Northeastern (23-10) – The Boston school beat No. 1 seed Hofstra 82-74 in the Colonial Athletic Association title game. This is Northeastern’s ninth NCAA appearance; the Huskies qualified six times in the 1980s. No. 5 Auburn (26-9) – The Tigers beat Tennessee 84-64 for the Southeastern Conference title. Auburn is in the NCAA field for the second straight season, after a 15-year absence. Controversial coach Bruce Pearl was a top contender for the job long ago when Utah State hired Stew Morrill. No. 12 New Mexico State (30-4) – Utah transfer JoJo Zamora averages 7.5 points for the Aggies, who won a seventh Western Athletic Conference championship in eight years by beating Grand Canyon 89-57. NMSU is “a very dangerous team,” CBS Sports’ Seth Davis said. First-round games Thursday, second-round-games Saturday at Vivint Smart Home Arena. All times Mountain. Auburn (5) vs. New Mexico State (12), 11:30 a.m.
Gonzaga (1) vs. Fairleigh Dickinson or Prairie View A&M (16), 5:27 p.m.
Syracuse (8) vs. Baylor (9), 30 minutes after the Gonzaga-TBD game ends.